I’ve always found that, in spite of the fact that there are numerous restaurants in Brantford, I tend to pick a favourite. When I was younger it was a place next to the Sanderson Centre. They cooked my favourite which was, and is, veal. Of course, now I have changed my tastes, as we tend to do as we get into our senior years. I prefer foods that are soft, fragrant and have smaller portions, but this isn’t really about me. My daughter is doing well now, but that was not the case a year ago. She began having violent stomach problems. The doctors did test after test. They seemed to be at odds as to what might be the problem. It isn’t pleasant to spend most of your nights in the bathroom instead of sleeping in preparation for work. She lived on liquids for days at a time and lost a great deal of weight and much of her physical strength. It was very scary not knowing what was wrong, and nothing seemed to get rid of the problem. She finally went to a dietitian who was able to help her to a great extent. It seemed that although she is not celiac (the tests finally determined this), she is sensitive to gluten, fructose, glucose, and other artificial sweeteners as well as having ulcers. It seems that real sugar is safe. I began by making gluten free bread, cookies and muffins for her. It was pretty much trial and error. The supplies come from the bulk food store and are expensive. It is also time consuming. I no longer live in Brantford and she lives way out in the country. This made it difficult to get the product to her and it didn’t keep nearly long enough. Having only a short time for lunch, she had to do something that was safe. Taking her lunch every day got to be tiresome. It is for this reason that she found Sophia’s. She started looking for someplace where she could get lunch where it was safe for her to eat. Her bodily reaction to mistakes was not acceptable considering her job. 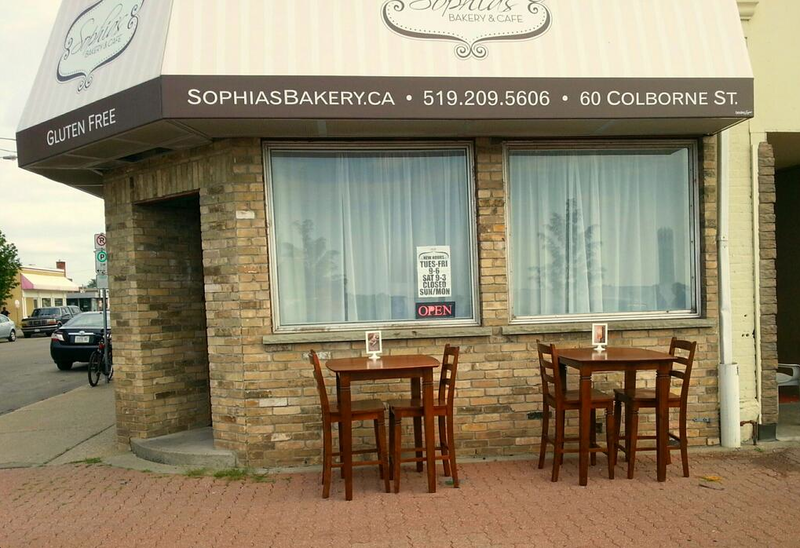 On a cold winter afternoon she invited me to Sophia’s, a restaurant in Brantford on the corner of Colborne and King. When you walk in you see simple tables, high ceilings with lots of decorative trim, all painted white, and a small counter. I was immediately made welcome. The place isn’t big, it isn’t fancy, but the smells when you walk in reach out and grab you. As a child I remember being taken to the bakery on Saturday morning and given a cookie by the lady who made all the wonderful things being sold. I still love the smell of baking bread and the spices that go with baking. Sophia’s is a gluten-free place. Yes, you can buy cookies, shortbread, white and dark breads (not wheat of course), and lovely sandwiches. This building is one of the remaining classic buildings of Brantford, from when that area was still the old downtown. Most of the buildings are gone now, either torn down to make room for the new, or burned down due to fire hazards of long ago, including several hotels. This building however, kept its charm. Now it faces empty space where once there were stores bustling with shoppers. Times and spaces change. To be honest, having had little luck with creating an acceptable bread myself, I was a bit sceptical. I was told that the secret recipe for their delicious bread had taken six years to develop. The whole thing came from the fact that their daughter Sophia (the restaurant is named after her) was diagnosed as Celiac, thus the search for acceptable foods and goodies for their little girl. So, my daughter and I had a wonderful lunch. She got to eat things that wouldn’t make her sick and I got to try some new things I hadn’t tried before. Due to many food allergies of my own, this took some trust on my part. I can relate to her problems. Since then we have found that many of the people we know have these same problems or they know someone who does. In fact, they seem to be growing. The symptoms of celiac disease are debilitating to say the least, and life threatening at its worst. The safest foods are closest to the ground, no preservatives, no steroids and for some, little or no meats. It’s good to know that there is at least one place where the food is good, and the atmosphere pleasant. Each time I come back to the town of my birth, back to my home as it were, I find new changes, new places to explore, and sadly new spaces where some old building, some old friend from the past is gone, but we hope that Sophia’s stays and becomes a part of Brantford’s traditions.